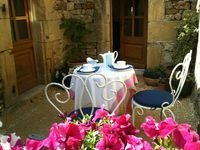 Holiday accommodation Les Magnolias: enjoy and unwind at the Dordogne river bank - Holiday home Rosette: romantic guest house with riverside terrace. Property 8: Holiday accommodation Les Magnolias: enjoy and unwind at the Dordogne river bank - Holiday home Rosette: romantic guest house with riverside terrace. Property 26: Peace and Tranquility in France. Rustic one bedroom Gite. Property 30: Gite with Private Garden and Pool with Stunning Views, don't delay, book today! Property 31: Beautiful, renovated house in the Dordogne, near Lalinde, Couze and Beaumont. Property 50: Splendid detached villa with pool in the heart of the countryside. Les Ronces was everything we hoped for. Very quiet, very dark at night, gorgeous stars. Everything worked, we cooked most nights, the British Television was smashing. The pool was perfect as the weather was warm and we were beat after daily exploring. Mandy was a terrific hostess and made our say extra special with her local knowledge. The area is chock full of things to see. Bergerac, Perigeaux, Beaumont ( you gotta visit their hardware store), and don't miss Monpazier a real gem of a very old French village. Very nice indeed.